Sometimes moments in baseball are bigger than rivalries. Orioles management recognized that fact when they invited Mike Yastrzemski to come to Fort Myers Sunday to play against the Red Sox at JetBlue Park, where his grandfather Carl Yastrzemski would be. And Carl Yastrzemski did get to see his 23-year-old grandson play, as he entered as a pinch runner in the sixth inning. Mike Yastrzemski was a star outfielder at St. John’s Prep in Danvers, Mass. before attending Vanderbilt University. He was drafted by the Sox in 2009 and the Mariners in 2012, but chose to finish his time at Vanderbilt. The Orioles drafted him in the 14th round in 2013. 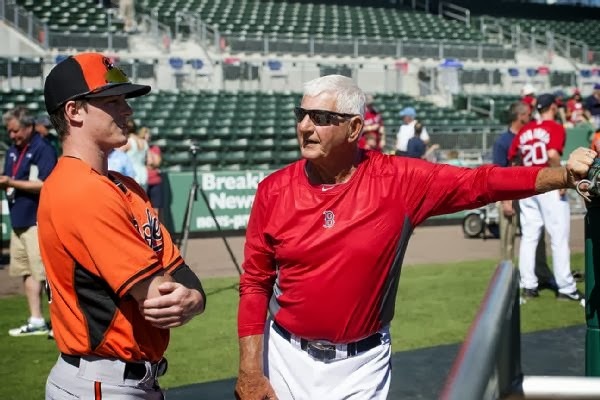 Carl Yastrzemski is glad that his grandson ended up in Baltimore rather than Boston. “Without a doubt,” Carl said as reported by the Boston Globe’s Nick Cafardo. “I think if he had signed, there would have been a lot of pressure. He likes Baltimore and he’s with a great organization. We also have one of our former Red Sox Triple A managers, RJ [Ron Johnson], taking care of him. Mike obviously learned a thing or two from his grandfather growing up, but he got to where he is today with his own talent. Still, that talent was honed with the help of his Hall of Famer grandfather, who pitched in even more after the death of Mike’s father, Carl’s son Carl Michael Yastrzemski, Jr., from a heart attack in 2004. They worked on hitting together while Mike was in high school, and now Mike even sports a similar stance to his grandfather. Mike hit .273 with three home runs and 25 RBIs last season with the Aberdeen IronBirds, a short-season single-A Orioles affiliate.